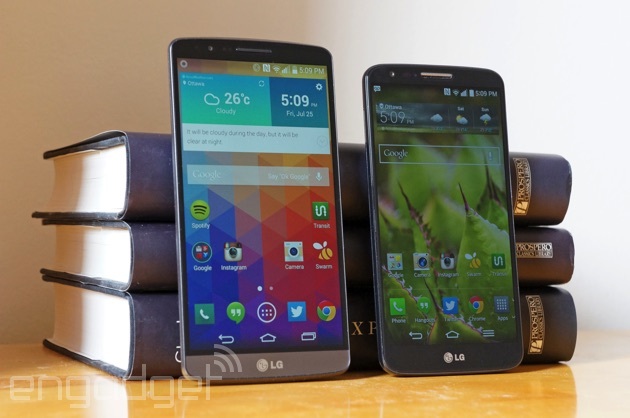 Living with the G3: Can LG's newest flagship be as good as its predecessor? You typically expect the latest smartphones to represent clear steps forward over their predecessors. However, I've been hearing a lot of people characterize the LG G3 as a baby step ahead of the G2, or even a step backward. That had me more than a little worried. Was I going to hate the follow-up to one of my favorite phones from 2013? There was only one way to find out, so I spent a few weeks with the G3 to see if those fears were overblown. To start: a lot of the sacrifices made to get that extra-sharp Quad HD screen don't matter that much in real life. The G3's LCD isn't as eye-searingly bright as the G2's, but it's still good enough that I could easily see it outdoors. I also didn't run into the heat-related brightness throttling that some complain about, although I don't doubt that it happens. Battery life wasn't as strong as it was on the G2, but that older handset seemingly lasted forever -- my G3 could still handle a day full of email, Instagram and Twitter, even with a Pebble smartwatch adding to the energy drain. If you were enticed by that larger, sharper screen in a (relatively) small body, you can relax. For the most part, the screen is as good as you'd hope, and it's definitely your best bet if you feel the Galaxy Note 4 and iPhone 6 Plus are too unwieldy for the display area you get. With that said, LG went a bit overboard with sharpening in an attempt to emphasize that super-high resolution. There were several times when I could see a halo around text that was clearly the result of excessive image processing, and you have to resort to unofficial software to turn it off. While the effect doesn't really sour the experience for what's otherwise a pleasing screen, it's prominent enough that I'd point you to the Note 4 if you want a large Quad HD display without significant quirks. The G3's camera is a tougher call. The laser focus does lock on to subjects a bit faster than on the G2 (and many other 2013 phones), but it didn't produce a night-and-day difference in my ability to capture a scene. As with the last-gen model, the G3's 13-megapixel shooter is frequently good, but rarely great. While I could usually count on it to produce a quality shot, the muted colors and slightly reduced low-light performance left me underwhelmed. The apparent step backward certainly wouldn't dissuade me from getting a G3 all by itself. However, I'd prefer Sony's Xperia Z3 series (for the higher resolution) or Apple's iPhone 6 lineup (for more lifelike colors) if I were looking for a tangible upgrade over the G2's cam. It may be worth trading up for the software, which feels like a breath of fresh air. The G2's take on Android was overly flashy, with too many unhelpful features and on-by-default animations; the G3's interface isn't exactly stripped down, but it rarely seemed to get in my way. About my biggest gripe was Smart Notice, which tries too hard to mimic Google Now with less-than-useful alerts ("the temperature will change" isn't a revelation, LG). I'd say HTC's fast, minimalist Sense and Motorola's lightly customized stock interface are my picks for the best Android launchers, but the G3's software front end trumps both what I've seen on the G2 and recent Samsung phones. Would I get a G3 if I were suddenly in the market for a phone? I have to admit, that combination of a large screen with a small profile is tempting. This is the only 5.5-inch phone I've used that doesn't put strain on my hands or my pocket. And as a whole, I enjoyed using it. While it rarely did anything spectacularly well, it was a reliable workhorse that seldom let me down. In a sense, though, that's the problem. The G2 was exciting partly because it pushed the boundaries of what you expected from smartphones with a seemingly physics-defying screen and epic-length battery life. The G3 pushes the boundaries a bit further and is indeed an improvement over the G2, but it's ultimately more of the same. Although I'd get one over its ancestor or the equally familiar-feeling Galaxy S5, I'd prefer the new Moto X, One M8 or Xperia Z3 if I wanted a 5-inch or larger Android phone. They're not always better than the G3, but they clearly stand out where LG's device only occasionally gets ahead of the pack.